Powerful Logging Capabilities for all events. What happened? When did it happen? Why did it happen? 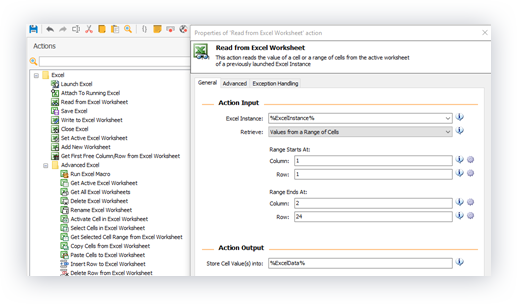 All the events that take place in WinAutomation are logged. From a Process Execution down to Server connectivity issues everything is visible and available for review. 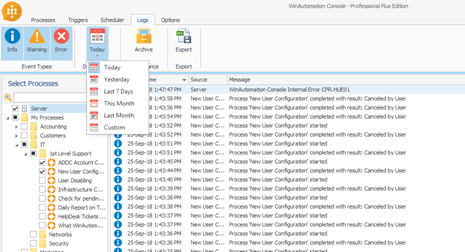 The dedicated Logs Tab in the WinAutomation Console provides significant information for all the processes that are/have been executed with details that have to do with Date & Time, the source of the event and a comprehensive and descriptive message. 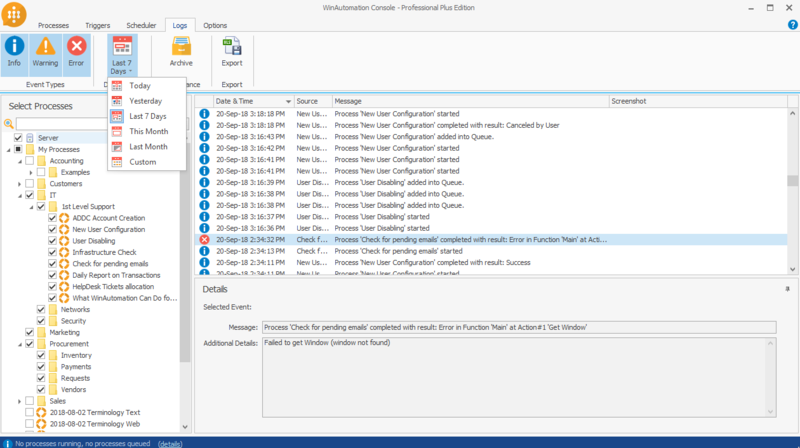 The events may be Informational, Warning or Error Messages and they provide a detailed history of all the activities that have taken place in your WinAutomation installation, from the moment you launched it for the first time. WinAutomation logs can be filtered by Date & Time, by Process or even by Event type to make your life easier, when searching for past events, or events of a certain type on a specific Process. Archiving capabilities are also supported in order to keep all your Logs safe and have a full Auditing history of your Automations and your WinAutomation activities throughout time. Be sure that you will not lose track of anything that has happened, as the platform apart from being able to log Server and Processes activity, it can also log details on Processes on a “step by step execution” manner. 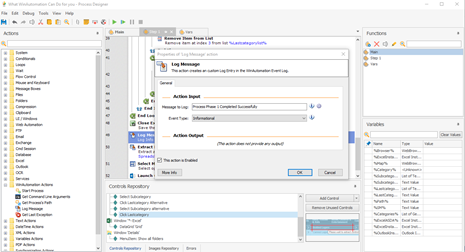 Apart from this, you are also able to Log any message you wish, while a process is being executing by making use of the dedicated “Log Message” action in the Process Designer. Keep yourself informed about every little detail that you wish to pin down and manage the Processes Logs in such way, that will give you absolute governance on your running Automations!